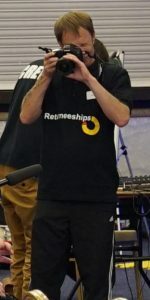 Stephen attended our Wolverhampton Returneeship course in 2018 and was offered a job whilst on the course; due to this incredible outcome we asked him if he would be willing to tell us about his journey. This is what he said. Stephen had always gone where the work was, which meant he had built up experience in mechanics, print engineering, security, silver service and pub management. Before being made redundant ten years ago, he had been running a working men’s club. When the committee made the decision to close it down, Stephen found himself unemployed. Over the next few years he found small amounts of temporary work including recycling management, but a full-time permanent position eluded him. 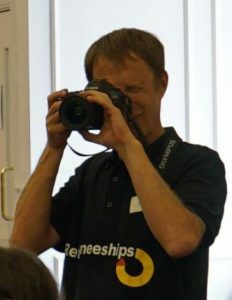 It was Stephen’s work coach at Wolverhampton job centre that recommended the Returneeship course to him. When he arrived at the course Stephen said he immediately felt at home and seeing all the equipment intrigued him. He opted for the photography as having dyslexia, it felt like an easier option and it meant he was out and about exploring Wolverhampton, which he enjoys. Previously, wherever possible, Stephen tried to avoid classroom situations due to his dyslexia. This time, when it came to the classroom element he felt very supported as he had a tutor next to him to help. Through the course he also met new people and got back into a routine with set hours.